Hospital visitors will be told they must do their bit to help win the battle against the superbug MRSA at a two-day summit later this week. Patients Association chairman Michael Summers said visitors had long been ignored in the fight against the superbug linked to 1,000 deaths a year. But he said it was vital that they washed their hands before going onto the wards. 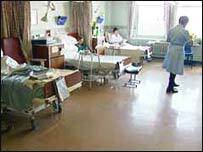 The issue will be raised at a Clean Hospitals Summit in London. The role of ambulances and better wound care will also be addressed. Politicians and health professionals are all due to attend the conference to discuss the best way to deal with hospital acquired infections. MRSA is one of the key battlegrounds in the election campaign. Deaths linked to the superbug doubled between 1999 and 2003, according to a report by the Office for National Statistics in February. But the government claimed last month it had turned the corner after latest figures showed that the numbers treated for the infection fell by 6% in the last year. The NHS Clean Your Hands campaign calls on everyone in hospital to wash their hands. Experts believe better hygiene could reduce the death rate by 15%. But Mr Summers said that, while staff were regularly washing their hands, he did not believe visitors were. "It is such a simple measure, but it could be vital. Most wards have the soaps at the entrance, only the odd old building does not, so why can't visitors wash their hands? "We have the alcohol soap washes all over hospitals at the moment. Staff are using them, but I don't think visitors are that much. "We have to change this, it is about time people visiting friends and relatives took responsibility." Jean Lawrence, chair of the Infection Control Nurses Association, agreed with the call. "Most wards have the soaps at the entrance - only the odd old building does not - so why can't visitors wash their hands? "I would urge staff and patients to get them to wash their hands, I would tell them." The political parties and government also agreed it would help. Shadow Health Secretary Andrew Lansley said: "There is every advantage in making it clear to visitors that they could be the carriers of bacteria." And Liberal Democrat spokesman Paul Burstow said "everybody has a role to play". The Department of Health pointed out it was part of the current NHS campaign.